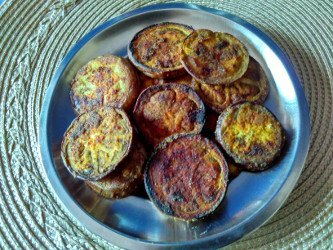 Vangyache kaap - shallow fried brinjal is a Maharashtrian style eggplant side dish recipe. 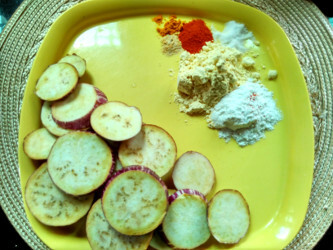 Vangyache kaap ingredients are few and it does not take too long to cook. It tastes good hot as well as at room temperature. Make them as a quick accompaniment for any meal or as a snack. 1. Wash and wipe eggplants. 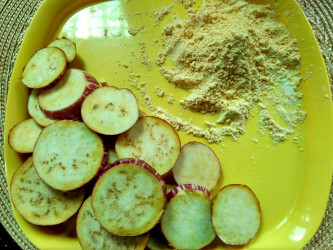 Slice them into thin rounds as shown in the image below. Take all the flours and spices in a plate. 2. Mix all the flours and spices together. 3. Press each slice in the flour mixture on both the sides. Keep aside for 5 minutes. 4. Heat a pan or tava on medium heat and add a little oil. Smear or spread oil with a brush or spoon. 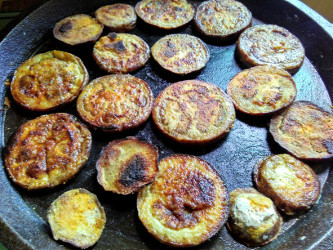 Place the brinjal slices on the oiled hot tava. I am using a cast iron tava, as shown in the image below. 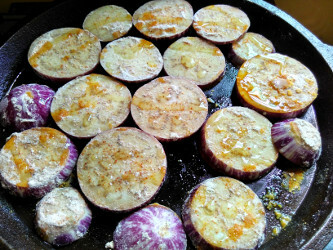 Let the brinjal slices cook on medium low flame. Drizzle a little oil on the slices. 5. 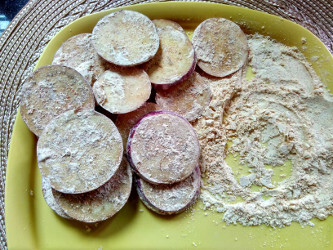 When the brinjal slices are browned on the lower side, turn them with a spatula or tongs so that they cook on the other side. You may cook them light brown or dark brown according to your choice. I prefer them to be dark brown. 6. When the other side is also browned to your liking, switch off the flame. Serve them hot or at room temperature. You may pack them for lunch to school or office along with some chapatis or rice. I do not cover the pan while cooking brinjals. You may cover them if you wish.